The conversation with Ajit Prasad Hembram was held in Centre for Studies in Social Science (old building), in 2016. Hembram is a Adivasi activist belonging to the Kherwal branch of the Santhal tribe. It has been translated to English by the Aainanagar Team. Kherwals live primarily in the Purulia district of Bengal and in parts of Jharhkhand. Since 2011 the Kherwals of Falaora village, Purulia, have started celebrating a martyrdom day for their mythical ancestor Hudur Durga/Mahishasura. 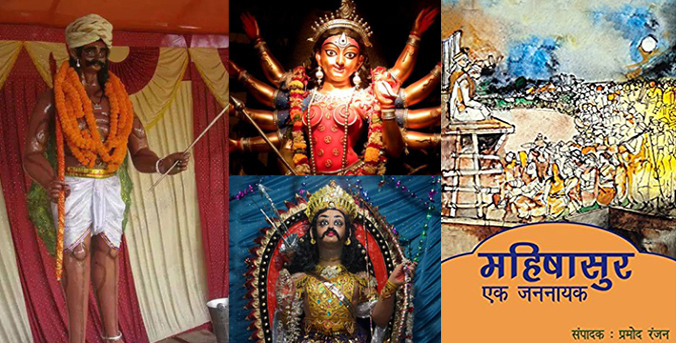 The custom of Mahishasura worship (as it is referred colloquially) has now spread all over India. As we continue to feel more and more stifled by a politicized Hindutva, as a society, scholars and non-scholars alike, are showing a keenness to visit the complexities of our regional histories. The Dasani festival is one such exploration. Today, the martyrdom of the Adivasi does not simply lie within books and myths, but come alive in various forms. Knowing one’s past and knowing it well is one of the principal strategies against that socio-cultural-political invasion. Q. Since when are you celebrating this Asura festival in Purulia? A. From 5th October, 2011. Q. What’s the story behind it? A. One of our major festivals is called Dasani (দশানি). You can say, it is a celebration of sadness. Sadness, because our land was ruined. In the ancient times, there was a great leader of us Kherwals (খেরোয়াল), who fought with the foreigner invaders. He was eventually tricked and murdered by them. We haven’t since found a leader like him. We commemorate him and call him Hudur Durga. Dasani is a celebration of his memory. Q. So it is a ‘martyr day’ for the Asura; tell us a bit more about its history. A. The history lies with our elders, and we pass it to our youth. We memorialize a land that belonged to us. A land named Chaichampa (চাইচম্পা). It was a land of happiness. Those days, many of our ancestors were educated and lived in big houses. They were traders; there was no poverty among us. We mention all these in our songs. Our leader—now known as Mahishasura—lived in Chaichampa or Champa, as it was colloquially called. During his reign, the Aryans invaded that land. Mahishasura tried to defend it. You know we call him Hudur Durga; never Mahishasura. Only later we realized that our Hudur Durga is known by others as Mahishasura. Now the foreigner Aryans were no match for our king. So, they tried to figure out his points of weakness. And they found out that our ancestors lived by certain norms. Even today, domestic violence, oppression of women etc. are comparatively infrequent in our society. Those days our ancestors did not fight women. The Aryans used this information to trick him into a marriage with an Aryan woman. Whichever form this story may be narrated, the marriage is always mentioned in it. When Hudur Durga was killed with the help of his newly-wed wife, our ancestors lost their only leader. They themselves were the next targets. So they felt doomed, and decided that they would all die if they tried to resist anymore. So they fled Champa. Even during their travel, they held the same belief that men did not fight women. So they dressed up as women. Dasani festival existed even before Hudur Durga’s death. But at that time it was a celebration of happiness; full of dance, music and merriment. When he died, the same Dasani became a festival of mourning—the lyrics of the songs changed accordingly. Now, the lamenting expression “haay haay” is always used in these songs. Our ancestors too sang and danced, dressed as women, and fled along the banks of the river Ganga. Q. Why do you call it a martyr day? Why not a day of worship? A. Hudur Durga is not among our gods whom we worship all through the year. He was a martyred king. We spend five days remembering him. We call him ‘hNorh’ (হোঁড়). HNorh means human—an ancient human. His land is like an aspired heaven to us. Even if one of us Santhals turns out to be a millionaire today, he would agree that his own happiness is little compared to those living in that land of eternal happiness. We had to give away such happiness due to the invasion. We even lost our worthy leader; this is unforgettable. Ours is a democratic society, so we usually do not glorify ascents of individuals. Except a rare few—Sidhu, Kanu, Birsa Munda Baba… Hudur Durga is among that rare few. He is an unforgettable ideal to us, unjustly murdered by the enemy in a war. So we celebrate his martyrdom. Q. During the Mahalaya—the first day of the ten days long worship custom of Durga—in the television programs, the Asuras are always portrayed as evil powers. What is your opinion regarding that? A. You see, an enemy is always perceived as evil. The Imams in the radical Muslim groups may look evil to many of us because of the terrorism. Not even all Muslims may consider him as Khalifa—but his own followers will. Now he possibly cannot be compared to our context. But enemy is always considered as evil. We have seen the same in the Indian history. Our freedom-fighters were evil to the colonizers. A. In the eyes of the foreigners, yes. The foreigners those days considered the indigenous men as evil. And that became the history, their history. We’re Santhals. We’re a branch of the Kherwal tribe—a large community. Now many of those who belong to this community use the surname ‘Asur’. It is like our other surnames, like ‘Murmu’. These ‘Asur’s are still living in certain districts of West Bengal—North Dinajpur, South Dinajpur, some parts of Jharhkhand. They are exactly like us—our very own tribe, living in this land. Now many of the people of this land find their ancestors evil; that’s just sad, if we and our ancestors are still considered as evil—be it Mahishasura or Ravana. It might have still made sense if there was a real war going on between us. But there isn’t. Q. During your festival in Purulia, you claimed that the tradition of placing the idol of Mahishasura or Hudur Durga at the feet of Durga should change. Tell us a bit more about that. A. Yes. Let them worship the goddess all through the year in whatever shape or manner. But since Hudur Durga was our ancestor, it hurts us to see him at her feet during her worship. During Dasani, we Santhals dance and remember our history. And it is our norm not to see the idol of the goddess Durga during the Durgapuja. Simply because we can’t watch Mahishasura placed down there. Yes, he lost. But establishing such a stereotype out of that for centuries is not fair. Q. In West Bengal, is Purulia the first in starting this? A. As far as I know, it is the first, but I may be wrong. This year, I think, about 500 such celebrations happened in India. It happened in JNU in Delhi, of course. I have even met some of the students. What I understood from talking to them is, the festival that we organized in our Falaora village in Purulia in 2011 was the first such in India. Q. Why 2011? Why not before? A. We knew the stories, yes. But we didn’t know what to do with them. Then we got involved in the Jharhkhand movement and the Bhasha Andolan. That is when we started becoming aware of our identity; we came to know that according to Hindu religious texts we were not Hindus, and that our ancestors were considered as antagonists—Asuras, Danavas, Rakshasas. In 2011, even much before BJP came to power, in Astha Channel Ramdev Baba used to say that he would supply election candidates to the whole country for the parliament election of 2014, to establish Hindutwa Raj. Finally, he didn’t have to, because BJP anyway came back to power! Nevertheless, during that time, he used to campaign in that channel: “We’d remake Rama’s India, Krishna’s India, the holy saints’ India.” He used to label the Vedic era as the golden era, while interpreting the Vedas. He used Yoga to reach out to a great number of people. I saw these things on TV and felt that if this is how things were, then we would soon be obliterated. I felt sad. Yet I hadn’t thought of organizing this celebration. In our village there are people from many castes and tribes. We Santhals do not go to the Hindu temples much. In fact in particular, we don’t have any Hindu temple in our own village. We do not follow those customs. But our women do go to worship Bipattarini. One such worship day, I was at home and I felt strange thinking about this custom. I felt, our own people did not know our identity, our history. And even if very few of us did know it, we didn’t have any influence on the rest of the community. I was thinking of a way out that same night. First the thought of Ravana came to my mind. But the stories of Ravana did not have much intersection with our culture. His land was far away from ours. Much earlier, I had read about Mahishasura from the books of Parimal Hembram in Kolkata, and understood that he was on our side whereas Durga was on the Aryan side. Then I thought of starting this festival. What is Asura and Devta (god) in today’s context? Wherein history do they lie? The descendants of Asuras and Devtas still reside here. Who are they? Because of our lack of knowledge about our own history, we are unable to preserve what our ancestors’ deeds. I felt that this program could be one way of starting to explore that history. So I started it. Q. Through this exploration, do you feel that the Hindu traditional influence within your community has reduced somewhat? A. You see for example, in the region where we live, others sort of look down upon us tribal people. I feel that this attitude comes from their own weakness. Our food habits—the fact that we eat all sorts of birds and animals, be it a pig or a cow—disgust them. But it is our own culture and custom and there is nothing disgusting in it. When we started this program, it became an exploration of history and culture instead of religiosity. Our own religious narratives started coming up as social studies. Then slowly, even those who were disgusted at us started considering us as fellow humans. We are now not as looked down upon as before, when there was no celebration of Hudur Durga. Now others at least listen to us. Q. Did you ever face any resistance or problem from those outside your tribe? A. No, nothing like that. There is a Durgapuja that takes place at the same time, within 200 meters from where we hold our festival. We do this at the upper side of the village. Durgapujas usually take place in the lower lands. A. It’s difficult to say precisely who. Hindus do it, to be precise. Q. What about your people—are they participating in these Durgapujas? A. You know even Muslims go to Hindu temples to chase away diseases or such like! There are certain areas where they even organize the Durgapuja. That way, some of us do attend the Durgapuja in Dhanbad and some such places. From the day we started commemorating Hudur Durga, whenever we enter the pandal, where the idols are placed, our people first pay respect to Mahishasura in their mind. Instead of seeing all the other idols of Ganesh, Kartik, Lakshmi, Saraswati or Durga herself, they first see Mahishasura, because he is right in front of them—under the feet of the goddess. As long as they didn’t know about the history it didn’t mean much, but now many of them feel sad. Q. So they are at least relearning the history? A. Yes. And not just those within the Kherwal tribe. Many others have started showing interest. The Dasani songs contain all of our history. We do not have anything in written format. Q. The songs are also being re-explored then? A. Yes. The writers and literary folks among us are looking after these things. They knew about this—may be not in so much details—but as we’re doing this, they too are learning more about it. More and more people are contacting us now, asking to be a part of this. Q. Which month does this celebration take place? A. Ashwin. The songs are sung all through that month. It has become our month of mourning. The upper and lower side of the village is defined in terms of distance from water. The upper part is further away from the river or equivalent water source. Huzur durga jug gig jio.